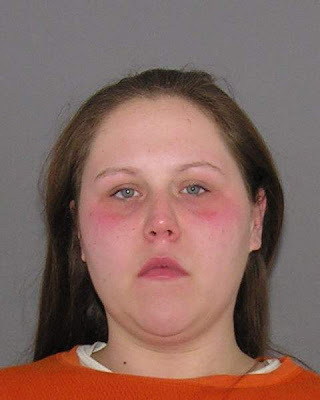 Cincinnati police said they found a Clermont County mother passed out on drugs and slumped over the wheel of her car late Monday with her 6-month-old son in the back seat. Jessika Partin, 24, of Mount Carmel, was booked into the Hamilton County jail early Tuesday on charges of child endangering and possession of drug abuse instruments. She told police she injected heroin earlier in the day, court records show. Officers found three spoons with heroin residue in the vehicle in a parking lot in the 5200 block of Madison Road in Madisonville. It was not immediately clear if the child was placed with a relative or in foster care. Does this look like the face of a woman who is a bad mother? I mean look how fat she is. I am sure the kid is well fed. Is H that bad that you have to do it while driving? Couldn't she at least waited till she got home?